Every facility deserves clean carpets. Midwest Floor Restore provides exceptional carpet cleaning services to leave carpets clean like the day they were installed. In order to provide our customers with the best solutions for carpet cleaning, we offer two methods: encapsulation and extraction. Give us a call to learn which is right for you. Our encapsulation cleaning method is very efficient and effective. This method assists in preventing too much moisture and detergent from being introduced into your carpet while neutralizing soils and residues that are attached to your carpet fiber. 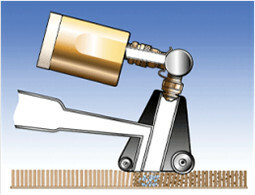 In addition, our solution prevents soils from easily attaching to the carpet fiber and acts as a soil barrier. In general carpet cleaning chemicals incorporate detergents to remove soils. These detergents are, by design, sticky so they can attract dirt. They have an affinity for greasy soil, surrounding it to separate it from the carpet fiber. This can be troublesome if extraction is not thoroughly accomplished. The end result can be a dirt trap that continues to grab soils and make your carpet dirtier than before the cleaning. 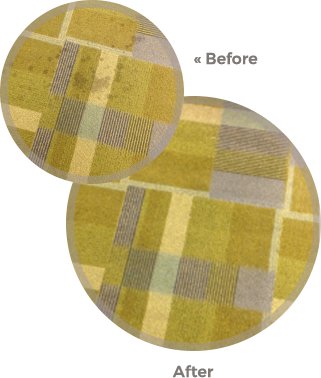 This is referred to as “rapid resoiling”, the result of cleaned carpet getting dirty faster than carpet with no residue. 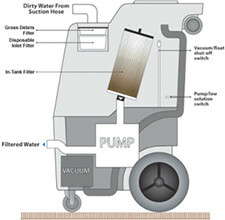 Vacuuming removes loose soil, but will not remove dirt attached to sticky residue. Dirt does not stick to crystalline residue left behind on carpet cleaned with encapsulating cleaning chemicals. Our encapsulation cleaning chemicals work using crystalline polymers along with a compatible detergent. 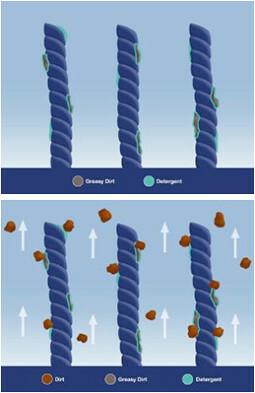 After the detergent has attracted and surrounded the greasy soil, the polymers “encapsulate” both the detergent and soil. As this encapsulated soil dries, it crystallizes into a dry (not sticky) residue. The remaining dry soil is then removed by your regular vacuuming resulting in cleaner fresher carpet in your facility. We use extractors from a revolutionary manufacturer that designs eco-friendly carpet cleaning systems and high-performance specialty tools with innovative patented technology that is radically different from other cleaning systems. This technology provides superior moisture-controlled cleaning, faster dry times and increased cleaning productivity that is unmatched by standard carpet extractors on the market today.